As Washington and Beijing try to resolve their trade disputes, several big companies are caught in the middle. One is Qualcomm (QCOM), an American chipmaker whose $44 billion purchase of NXP Semiconductors (NXPI), a Dutch company, has been waiting for Chinese regulators' approval. Far more controversial is the case of ZTE (ZTCOF), the Chinese phone and telecom equipment maker that was crippled by a US export ban issued last month in punishment for what the US said were violations of its sanctions against North Korea and Iran. Easing penalties on ZTE is a key priority for Chinese President Xi Jinping, and Trump has indicated he's willing to yield in order to move ahead with further trade discussions. But members of Congress from both parties, many increasingly wary of China's trade practices, believe such leniency would be a mistake. A growing number of senators have drawn a red line on ZTE, and have been vocal in recent days about their opposition to restoring the company. "The only thing China is going to respond to is consequential actions over a sustained period of time, and putting a company like ZTE out of business is the kind of consequential action that ... China will finally see that we are taking this stuff seriously," Senator Marco Rubio, a Republican, said Sunday on CBS' "Face the Nation." On Friday, the Commerce Department informed lawmakers about the outlines of a tentative deal that could save ZTE. Trump, in a Friday evening tweet, wrote of the deal, "I closed (ZTE) down then let it reopen with high level security guarantees, change of management and board, must purchase U.S. parts and pay a $1.3 Billion fine." The blowback from Capitol Hill was immediate and severe, raising questions about whether Trump will follow through. "ZTE presents a national security threat to the United States—and nothing in your reported deal addresses that fundamental fact. If you won't put our security before Chinese jobs, Congress will act on a bipartisan basis to stop you," Senator Chris Van Hollen, a Democrat, tweeted Saturday. The political situation in Washington complicates trade talks between the world's two largest economies, which are still in progress. A week ago, China and the United States agreed to put threats of tens of billions of dollars in tariffs on hold. The countries said China would "significantly increase" purchases of US goods and services to reduce their trade imbalance, a top Trump administration demand. But many details still need to be worked out. China has not put a dollar amount on its commitment to boost purchases, and analysts have said it would be tough for Beijing to make a big difference to the trade imbalance. Commerce Secretary Wilbur Ross is scheduled to go to China on June 2 through June 4 to continue discussions, according to the Chinese Foreign Ministry. Even more challenging are US demands that China stop forcing American companies to hand over intellectual property and halt efforts to subsidize high-tech industries. Experts are skeptical that Beijing will agree to make changes in those areas. China, meanwhile, has power over Qualcomm's purchase of NXP. Chinese regulatory approval is still needed for the acquisition to go through. Beijing's reluctance to green-light the deal has coincided with the trade tensions between the two countries, although authorities insist the delay is over antitrust concerns. Media reports over the weekend indicated there could be some movement from regulators this week, though nothing has been finalized yet. The odds of approval look better since China endorsed the sale of Toshiba's (TOSYY) prized chip unit to a group of investors led by the private equity firm Bain Capital. 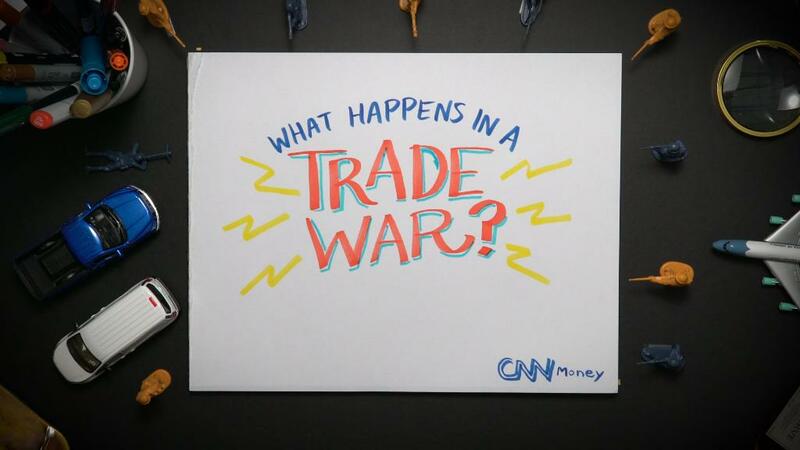 Previously, there were questions about whether China would hold up that $18 billion deal to gain leverage over the United States during trade negotiations. Meantime, a potential summit between Trump and North Korean leader Kim Jong Un looms large. The meeting, which was initially scheduled for June 12 in Singapore, was abruptly canceled Thursday by Trump, who cited "tremendous anger and open hostility" in North Korea's most recent statement. But two days later, he revived hopes that the summit may go ahead. Trump had previously indicated that he's willing to make moves on trade with China that could secure the country's support on North Korea. "When I'm thinking about trade — you know, I read you folks and you say, 'Well, why does he' — there's a much bigger picture that I have in mind," Trump said earlier last week. "I'm also thinking about what they're doing to help us with peace with North Korea. That's a very important element. So we'll see how it all works out." -- CNN's Phil Mattingly and Jeremy Diamond contributed to this report.